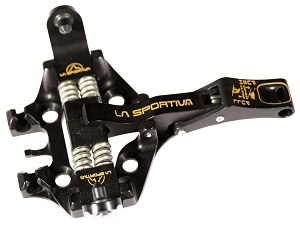 - Update 2/14/2013 - La Sportiva has discontinued the RT binding for the 2013/14 season. Historically known as a quality footwear company, La Sportiva entered the ski market in 2011 with a surprisingly wide range of quality ski gear. Rather than develop these products from scratch and risk learning difficult design lessons early on, La Sportiva contracted with well established manufacturers to get things right from the start. For their ski bindings, they chose wisely with ATK, an Italian ski mountaineering company. While not widely known in the United States, ATK has a proven track record in Europe of making quality lightweight alpine touring bindings. And now those quality bindings are being distributed in the U.S., but with La Sportiva's yellow imprints in lieu of ATK's preferred palette of reds. Asthetics aside, it's a win for all involved; U.S. ski mountaineers certainly won't be complaining about more quality products to choose from. You'll notice a similar pattern of adjustability differences in the World Cup RSR race binding heel (first pic) and the more touring targeted RT. While they both feature a four hole drill pattern, the RT (second pic) has both a lateral and a vertical release adjustment screw, letting you customize the injury prevention features to your weight and style. 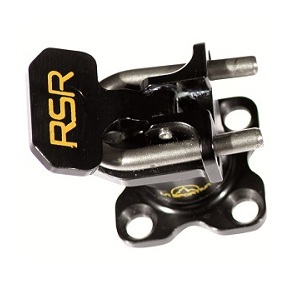 The RT heel pin housing, while skinnier than some well known models, rotates as one might expect in a touring binding. This gives two additional riser heights in addition to flat, though the highest setting requires the addition of an optional-but-included plastic piece to the top of the housing (not pictured). In contrast, like most race specific bindings, the RSR has only one riser option, namely flipping the flap down over the heel pins. It also rotates 90 degrees for a flat-on-ski mode. 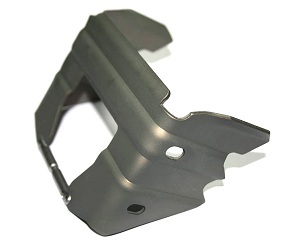 The RSR heel adjustment plate (first pic) takes the pressure of your ski technician at a cost of only 25 grams (0.9 ounces), since it's made of ultralight Ergal aluminum. It could also add to your rig's resale value as more people will be able to use it. The RT adjustment plate (second pic) adds 33 grams (1.2 ounces) to get the same 30mm of flexibility. Both plates raise your heel by 5mm, which is a ramp angle change unnoticeable by lots of skiers. The last major difference between the RT and RSR binding has to deal with options. As mentioned, both bindings support the addition of a sturdy and lightweight ski crampon (pictured first below), which also doubles a boot crampon in a pinch if you use the holes on the side to tie yourself in. In addtion, the RT has the ability to attach a braking system, seen in the second pic. 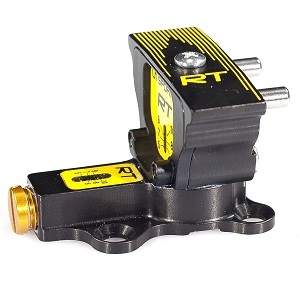 The RT ski brake is extremely lightweight, ranging between 64 and 72 grams (2.3 and 2.5 ounces) per ski depending on the width, which ranges from 75mm - 107mm. It's also very innovative in that it attaches to the toe piece of the binding instead of the heel piece as you might expect. This allows it to be used in touring mode as well as skiing mode, and properly retracts while you're locked in. 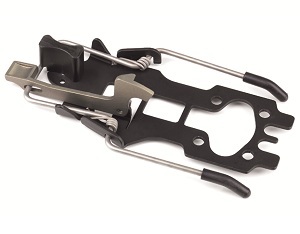 Since the toe also releases according to how you adjust the tension screw, it makes sense that it would also be able to stop the ski upon release. 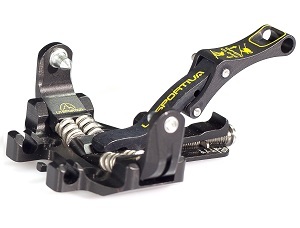 La Sportiva warns that this lightweight and clever system is a bit fragile, suggesting you disarm the brakes via a simple switch before doing anything abusive with your skis such as tossing them in the back of your car. So how does this all add up? As you can see, La Sportiva, via ATK, has made a strong entry into the U.S. market for tech style alpine touring bindings. The RSR binding, geared for the Rando race market, weighs in around $800 and a scant 145 grams (5.1 ounces). The RT binding will add 30 grams (1.1 ounces) and a host of adjustability, yet subtract $50. These weights and prices are competitive, and indications from the field suggest the ease of use of these bindings is also on target. Well played, La Sportiva. Any reason why La Sportiva has discontinued production of the RT? have they had reliability issues? Is something new coming out to replace it? Hi Ian, I am told it was a combination of factors that instigated the decision to cease importing the RT. There were some breakages, but not significant enough to be the sole reason for the decision. ATK still makes the binding with their own branding. I see your comment the RSR has a dual mode toe lock with both skiing and locked-out uphill modes. I can see some graphics related to that on the front lever. But I do not see a mechanism on your picture that reveals how that actually works. I see two coils of a spring. That would indicate to me the toe 'jumps' to locked mode automatically when you step in. Is there a way to overcome this? I am not too bothered about ISMF rules. I haven't seen a check for it. More concerned about possible injury. Hi Peter, the pic of the RSR binding was apparently taken at the perfect angle to hide the tongue that sticks out underneath the toe lever. The tongue has a groove in it, and depending on whether you seat the bottom of the lever in the groove, the toe is either locked or unlocked. Contrary to some marketing materials I've seen, in my experience it does not enter locked mode automatically. This could have been changed somewhere along the line by adjusting the strength of the spring in the toe lever hinge (similar to a change made by Plum). Might be a little late to the party.. I have a pair of these bindings and I'm wondering if they're compatible with a dynafit ski crampon? Hi Griff, in theory! Might be slight tolerance issues. These were made by ATK so the ATK crampons are sure to fit. What is 14 + 1?